Reasoning: Calendar related MCQs, How to solve quickly? What day of week was on 15th ugust,1947? Find the day on 10th May, 1857? Article prepared with help of Mr. Deepak Singh. What day of week was it on 5th November, 1989 if it was Monday on 4th April, 1988 ? What was the day on 15th august 1947? Here question tells us that 4th April 88 was Monday, so we have a ‘reference ‘day. Here question doesn’t give us any reference “day”. need to just mugup 2 table, and few steps. Although calendar question is not asked every year in every exam. But If and when calendar question is asked, just follow the given procedure and you’ll get the accurate answer= one mark is guaranteed=in that sense, cost: benefit is great. Name of the day will repeat after seven days. 1st August 2013= Thursday. Therefore 1st August + 7 =8th August also has to be Thursday. Then what day will be 10th August 2013? And 8 August + 2 =10 August will be Thursday + 2 days =>Saturday. If 9th of the month falls on the day preceding Sunday, then on what day will 1st of the month fall? Day name repeats after 7 days. Therefore 9 minus 7=2nd of the given month is also Saturday. +1 year When we proceed forward by one year, then 1 day is gained and vice-versa.Example,9th August 2013 is Friday, therefore 9th August 2014 has to be Friday+1=Saturday.Reverse is also true. When we move backward by one year, then 1 day is lost. 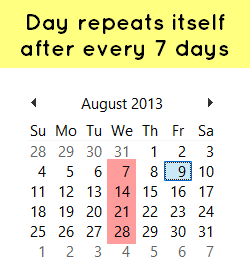 9th August 2014 is Saturday, therefore 9th August 2013 has to be Saturday minus 1=Friday. Exception to Leap Year day gain day loss– the date must have crossed 28th February if the coming year is a leap year for adding 2 days otherwise add 1 day. If 26th January 2011 is Wednesday … then 26th January 2012 would be Thursday (even if 2012 is leap year we have added +1 day, because 28th of February is not crossed). If 23rd March 2011 is Wednesday … then 23rd march 2012 would be Friday (+2 days. As 28th February of leap year is crossed). A year which is divisible by 4 is a leap year except, if it is divisible by 100 then we have to check it by dividing by 400. For e.g. 1988, 2008, 2012, 2016 etc. all are leap years as divided by 4. 2000, 2400, 1600 etc. all are leap as divided by 400 (100 and 4 too). 1700, 1800, 2100, 2200 etc. are not leap years as they are not divisible by 400 (even if they are divisible by 4). On 5th December 1993, Nirmala and Raju celebrated their anniversary on Sunday. What will be the day on their anniversary in 1997? Normal year jump +1 gain; Leap year jump +2 gain. Mrs. Susheela celebrated her wedding anniversary on Tuesday 30th September 1997. What will she celebrate her next wedding anniversary on same day (Tuesday)? Therefore, after 1997, next time Mrs.Susheela’s anniversary will be on same Tuesday on 30th September 2003 Ans A.
Dec 9, 2001 is Sunday then what was the day on Dec 9, 1971? 1971 to 2001=how many jumps? Out of those 30 years, how many leap years? but no need to manually count leap years. back to the start: 30 years jump and out of them 8 were leap years. Sunday Minus 3 days= (just count in your head): Saturday…Friday…Thursday. What day of week was it on 5th November,1989 if it was Monday on 4th April, 1988 ? For Non-Leap year, When we proceed forward by one year, then 1 day is gained and vice-versa. pickup remainders that add upto 7 and cancel them. Example: What was the day on 15th August 1947? ^ok but what is the use of above table? It tells us the number of “odd” days in that given year. I don’t want to bore you with the theory so just mug up those values. Just remember that 1 to 6 is Monday to Saturday and 0 or 7=Sunday. Subtract the given year by 1. Break into relevant years as in table #1. Now for the number in bracket (46), divide it by “4” and add quotient in same line. And when you divide 58 by 7, you get 58= (7*8)+2. Therefore remainder is 2. That means 15th August 1947 was Friday. ^as you see we had to sum of 31+28+31….=lot of time taken in doing the addition (+). 19=(7*2) + 5=therefore remainder is 5 and as per table#2, “5“ means Friday. Here both 56 and 14 are multiples of 7 so even if you divide them by 7, you’re going to get zero as remainder. when 14 is divided by 7 we get zero as remainder. Zero means Sunday. so final answer 10th May 1857 was Sunday. The 1st day of a century must be Tuesday, Thursday, or Saturday. The last day of a century cannot be Tuesday, Thursday, or Saturday. In 2013, Gandhi’s birth-anniversary is on Wednesday. In which nearest future year, will his birth-anniversary be on Monday? If 29th April 2013 is Monday then what is the day on 30th November 2013? This is brilliant. All tricks in one post. Thank you! !